A cluster is made up of a set of member nodes. The identifier for each node is a hostname:port:uid tuple. An Akka application can be distributed over a cluster with each node hosting some part of the application. Cluster membership and partitioning [*] of the application are decoupled. A node could be a member of a cluster without hosting any actors. Joining a cluster is initiated by issuing a Join command to one of the nodes in the cluster to join. 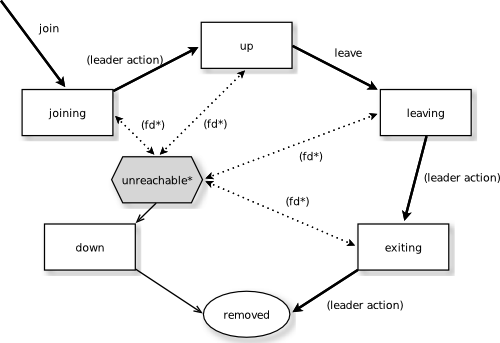 If an actor has persistent (durable) state then nothing needs to be done, other than migrating the actor.